You are more likely to see the White-Eyed Vireo than some of its relatives because it spends its time in lower parts of the canopy of trees and bushes. This bird is similar in size to a chickadee ( five to six inches long), with greenish-gray feathers above, a gray head, and pale yellow undersides. There are two narrow white bars on its wings, and the pale yellow eyerings around its unique white eyes are connected by a strip of yellow above the bill. Immature birds have a dark eye for the first few months. 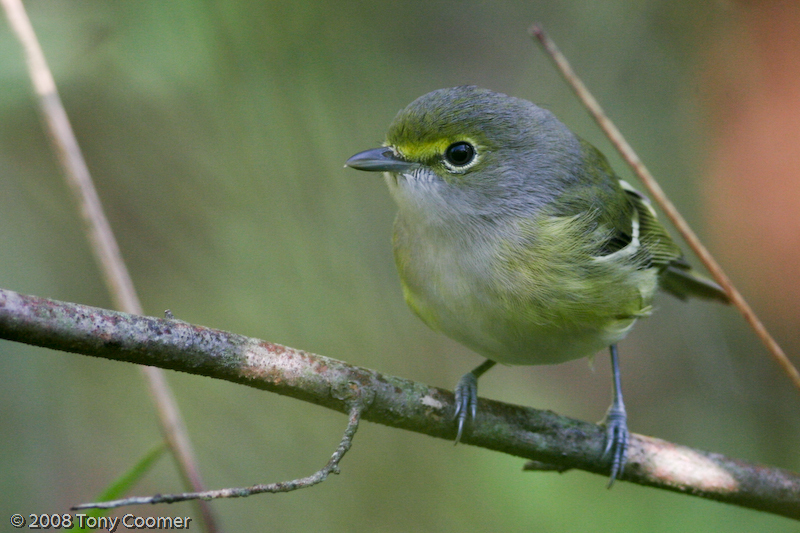 This species of vireo lives in forests, thickets, and old overgrown fields, and along wooded streams in the US east of the Great Plains, from Illinois to Connecticut south to Florida and eastern Mexico. It feeds on insects that it finds among the branches and foliage of trees and bushes. The female makes a hanging nest out of plant materials and insect and spider silk on a branch low in a tree, and then both birds of a pair incubate the eggs and feed the young. After the breeding season the birds migrate to the warmer regions of the southeastern US and eastern Mexico south to Cuba and Nicaragua for the winter.